If you're a regular reader of GeekTech, you probably already know how big of fans we are of Lego Cuusoo, the online breeding ground of ideas for new Lego sets. On Lego Cuusoo, you can suggest which sets Lego should build next, and other Cuusoo users can support them; if a set gets lots of support, the concept is submitted to Lego for consideration. We've seen lots of great ideas on Cuusoo, but this one for a Lego landspeeder might be one of the best. Created by Lego Cuusoo user Dapper-D2, this landspeeder is a Lego replica of the one Luke Skywalker drove around on Tatooine in Star Wars: A New Hope. According to Dapper-D2, it measures 13 inches long and about 7.5 inches wide, and took roughly 700 to 900 pieces to construct. Technical details aside, this thing just plain looks cool. Every detail is there, from the curved windshield to the dual front seats to the exposed detailing on one of the engines. 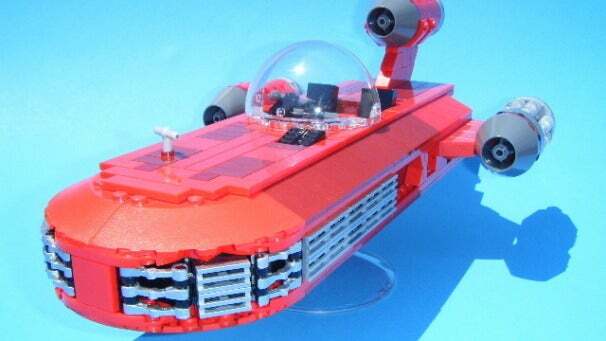 Right now, Dapper-D2's proposal has only 53 supporters--far short of the required 10,000 for Lego to consider turning the concept into an actual set you can buy. So if you want a landspeeder of your own--albeit one you can't actually ride in--head on over to Lego Cuusoo and show the landspeeder some love.